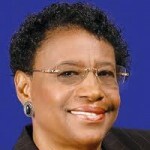 Barbara Charline Jordan was an American politician and a leader of the Civil Rights movement. She was the first African American elected to the Texas Senate after Reconstruction and the first southern black female elected to the United States House of Representatives. She received the Presidential Medal of Freedom, among numerous other honors. On her death she became the first African American woman to be buried in the Texas State Cemetery. In 1992, she was awarded the Spingarn Medal from the NAACP. In 1993, Jordan was honored with the Elizabeth Blackwell Award from Hobart and William Smith Colleges. In 1994, Jordan was awarded the Presidential Medal of Freedom. Many of Jordan's speeches have been collected in a 2007 publication from the University of Texas Press, Barbara Jordan: Speaking the Truth with Eloquent Thunder. In 2011, actor/playwright Jade Esteban Estrada portrayed Jordan in the solo musical comedy ICONS: The Lesbian and Gay History of the World, Vol. 5 which includes the song "Nancy's Eyes" sung by the character of Jordan with music and lyrics by Estrada.